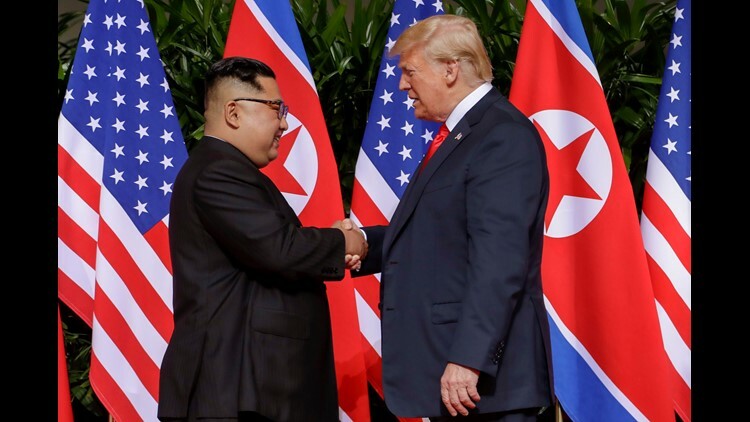 SINGAPORE — After more than a half-century of hostility between their two countries, President Trump and North Korean leader Kim Jong Un signed a document Tuesday pledging "to work toward complete denuclearization of the Korean Peninsula," but provided few details of how that might work. 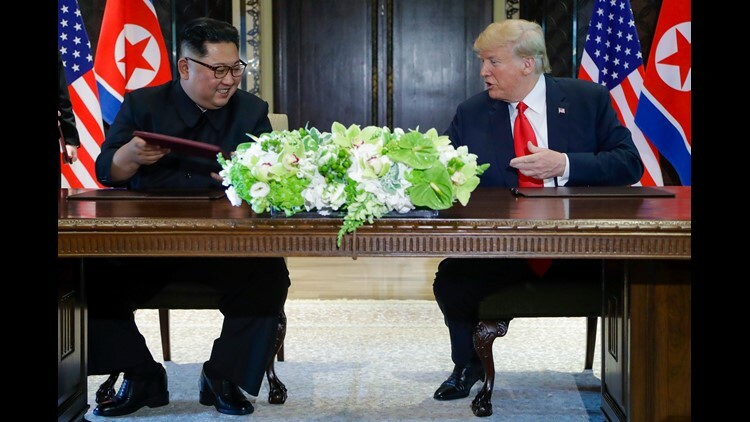 “We’re starting that process very quickly," Trump said during a brief signing ceremony, again providing few specifics following a day of ceremony and bonhomie with his former rival Kim. The statement of renewed U.S.-North Korean cooperation capped a four-hour-plus summit in which Trump and Kim had nothing but nice things to say about each other as they finally came face-to-face. The summit comes less than a year after the pair threatened each other with nuclear annihilation. Throughout the day, Kim refused to answer questions about whether he would be willing to give up nuclear weapons in exchange for economic assistance. Still, Trump claimed success by saying that "we had a really fantastic meeting" at a resort hotel that went "better than anybody could have expected, top of the line, really good." North Korea leader Kim Jong Un and President Donald Trump exchanged signed documents at the Capella resort on Sentosa Island in Singapore. The summit provided extraordinary pictures and surreal moments involving old enemies. Trump said that he and the North Korea leader he once denounced as "Little Rocket Man" had "developed a very special bond." For his part, Kim said he and Trump have "decided to leave the past behind." The joint statement said that Trump "committed to provide security guarantees" to the North Korean government, while Kim "reaffirmed his firm and unwavering commitment to complete denuclearization of the Korean Peninsula." It did not define "security guarantees," nor what "complete denuclearization" entails. In the past, North Korea has said it would include a withdrawal of U.S. troops from South Korea and a pullback of the U.S. nuclear umbrella that covers the Korean region. Similar agreements in the past have not lasted. 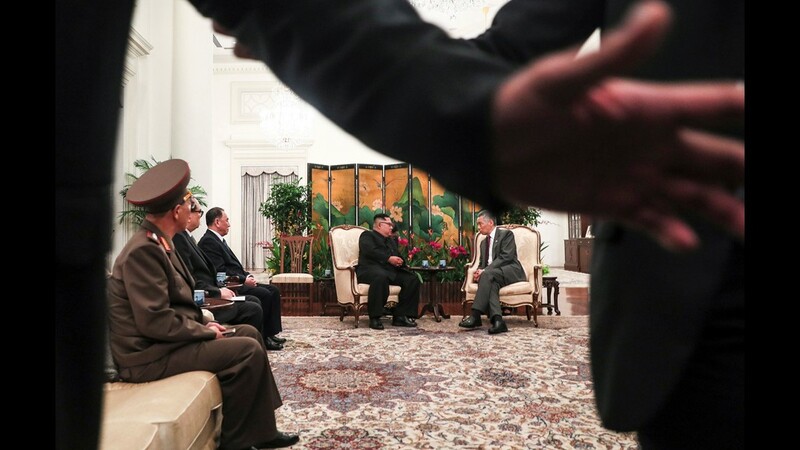 The statement also pledged new U.S.-North Korean relations "in accordance with the desire of the peoples of the two countries for peace and prosperity," and joint efforts to recover POW/MIA remains from the Korean War of more than six decades ago. Throughout the day, Trump and Kim staged frequent photo opportunities that showed them getting along. 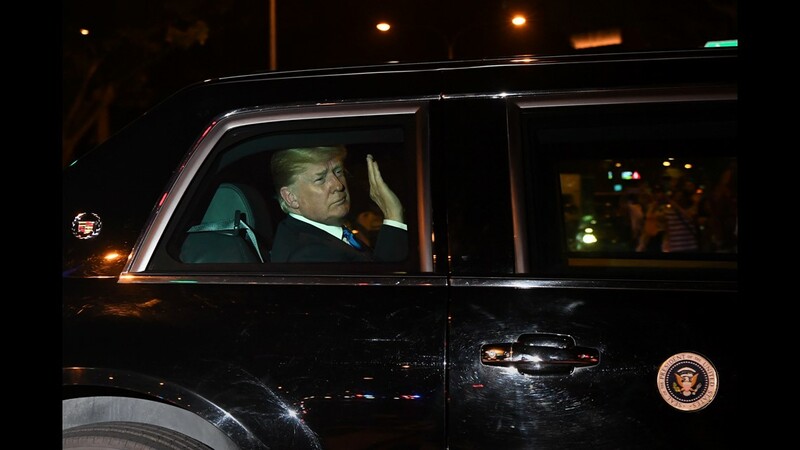 At one point during a post-lunch stroll on the hotel grounds, Trump showed Kim the interior of the presidential limousine known as "The Beast." Trump also said he would "absolutely" invite Kim to the White House. It was a day of pleasantries, but little public substance. After an initial one-on-one meeting with the North Korean leader, Trump said that things were "very, very good — excellent relationship." Later, at a bilateral meeting with aides from both sides, Trump said, "Mr. Chairman, it's a great honor to be with you, and I know that we will have tremendous success together." Trump also took a familiar jab at the press during the summit. As reporters yelled questions during the photo op, Trump told Kim, "The press, they never stop." Later, during a working lunch, Trump asked photographers for good pictures "so we look nice and handsome and thin." Trump and Kim chatted amiably out of earshot as they walked into the building for the private meeting that preceded a full bilateral conference that included aides and advisers. During a pre-summit tweet storm, Trump denounced "haters & losers" who said he should not have granted Kim — an autocrat accused of having political rivals killed — the prestige of a presidential meeting without more North Korean concessions. Citing the return of American hostages and a suspension of North Korean nuclear testing, Trump said that "these pundits, who have called me wrong from the beginning, have nothing else they can say! We will be fine!" While on his way to meet Kim, Trump also tweeted that White House economic adviser Larry Kudlow had suffered a heart attack and was hospitalized outside Washington, D.C. 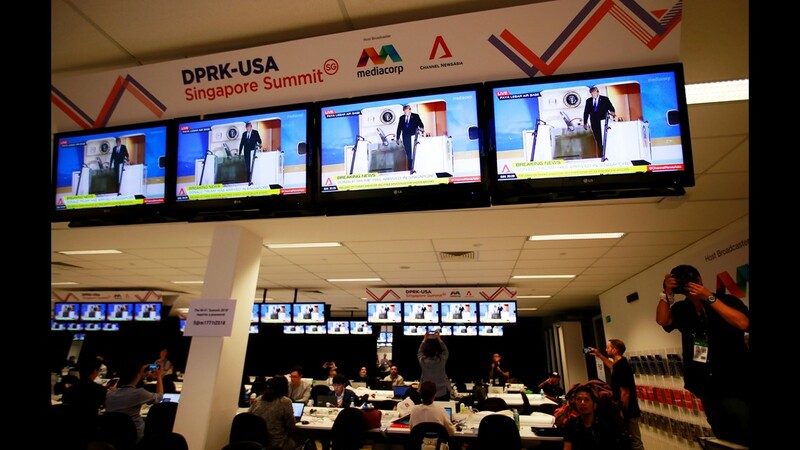 Some critics questioned the pomp surrounding the Singapore summit, saying it unduly elevated North Korea's rogue regime. President Trump shakes hands with North Korea leader Kim Jong Un at the Capella resort on Sentosa Island in Singapore. David Rothkopf, a visiting scholar at the Carnegie Endowment for International Peace, likened the event to Trump's old reality television show. "But," he added, "'The Apprentice' had more likable characters, more credible plots, and didn't involve the enslavement of 25 million people or prospect of nuclear war." Michael McFaul, an ambassador to Russia during the Barack Obama administration, called the summit a victory for North Korea diplomacy. "Tomorrow, the entire world will be treating Kim Jong un as a global leader, on stage with the leader of the most powerful country in the world," McFaul tweeted. "Human rights, assassinations abroad, etc. will unlikely be mentioned. That is a tremendous achievement for North Korean diplomacy." Trump and aides said they did not expect the summit to generate a comprehensive nuclear deal; they instead looked to set up a process to negotiate an agreement in which North Korea gives up nuclear weapons in exchange for economic assistance from the United States and other countries. 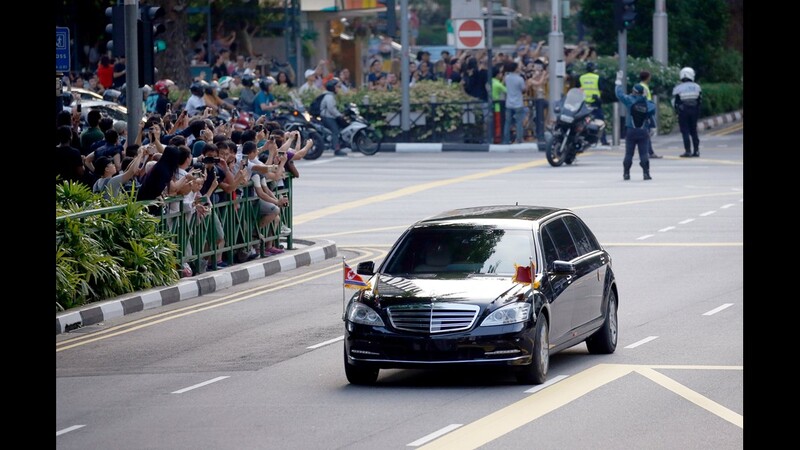 The two leaders began the meeting at 9 a.m. Tuesday, Singapore time — prime time Monday back in the USA. 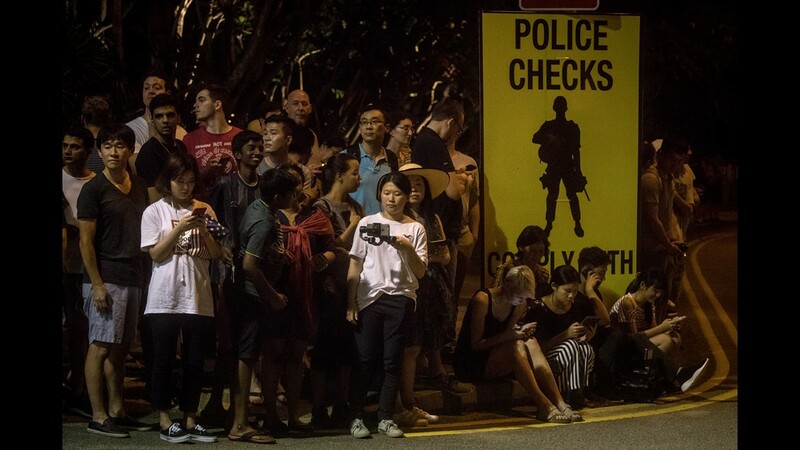 The summit took place at a resort hotel on Sentosa island, just off the Singapore mainland. Previously, Trump had pledged to rain "fire and fury" on North Korea if it continued to make nuclear threats. This week, the president said he looked forward to getting to know his new negotiating partner. Kim and his government are developing missiles that can carry nuclear weapons to the USA and have denounced Trump as a blustery "dotard." 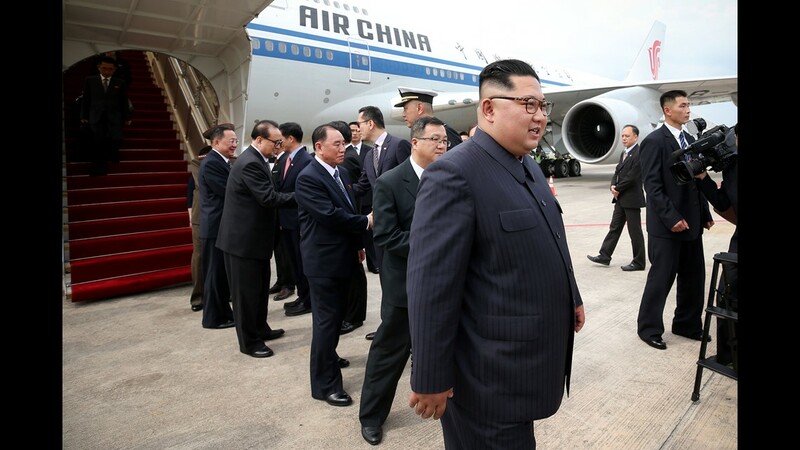 Described by his critics as a mini-Stalin, Kim was on something of a charm offensive in Singapore after arriving Sunday. On Monday night, he strolled the downtown area of this trade and finance capital, taking in the sights and posing for selfies with local citizens. Many analysts are skeptical that Kim will agree to fully give up nuclear weapons because he sees them as essential to his nation's security and self-identity. 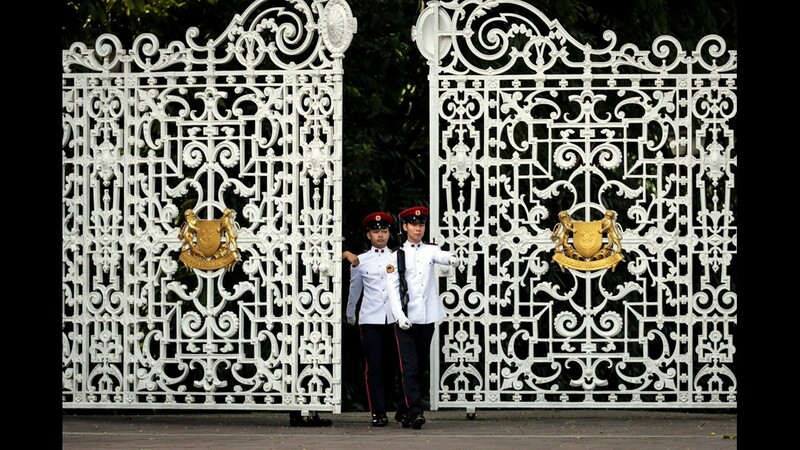 Although many still predicted that the initial Trump-Kim summit could at least yield an agreement to keep negotiating. "Depends on how you define success," said James Goldgeier, a visiting senior fellow with the Council on Foreign Relations. "Both leaders will want to trumpet it as a success, but it seems like this will largely be a photo op both can use for their domestic purposes."